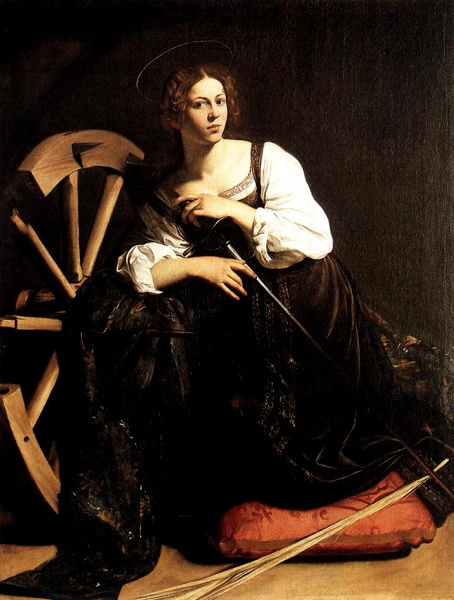 St. Catherine is always depicted with a wheel and she is the patron of any occupation that requires a wheel. During the Middle Ages St. Cahterine was viewed as an exemplary example for unmarried women. Therefore, in France and England St. Catherines’s Day is celebrated by unmarried women asking for husbands. (Excerpted from the soon to be released app: “Novena: Praying with the Saints” by Barbara Calamari and Sandra DiPasqua). I so Loved this story of ”this Catherine’. I so admire the brilliance of mind the Good God gave her. Her beauty was an added bonus from the Lord. So many of our Saints died horrific deaths. She was not spared. Please join with me. Her Feast Day is Nov 25th. thank you so much for coming to novena.com. ❤ and Prayers to ALL.